Service Animals and MS – read the newest Summer/Fall 2016 issue of The Motivator, available now in print and digital editions. Dr. Darbi Haynes-Lawrence takes readers along her eventful journey to partner with a service dog, encountering many benefits and hurdles along the way. MSAA’s President and CEO Gina Ross Murdoch talks about record-breaking outreach, a new online community, and upcoming events to support MSAA’s vital programs and services. Information is given on newly approved Zinbryta™ (daclizumab) and two investigational medications, Ocrevus™ (ocrelizumab) and siponimod. Read the latest issue at support.mymsaa.org/motivator. The latest issue of The Motivator is now available to order, download, or read the DIGITAL EDITION right on your desktop, tablet, or phone! … From family and friends to employers and coworkers, the diagnosis of MS can impact how we interact and care for one another. … Information is provided on three investigational medications as they make their way toward FDA approval, two of which are being studied for progressive MS.
… MSAA’s new President and CEO Gina Ross Murdoch talks about her exciting role as well as important events at MSAA. … The launch of MSAA’s redesigned and responsive website, ways to stay informed, and MSAA’s new video on pseudobulbar affect (PBA), are featured. Read the latest issue of The Motivator – and be sure to check out all of the interactive features in the NEW digital edition by clicking “View Digital Edition” on the page! The Winter/Spring 2015 issue of The Motivator is now available! Request your copy today or read it online with the all new digital edition! You can access the digital edition right from your desktop or mobile device and enjoy enhanced interactivity and special features such as tools to search for specific terms, change the font size, and add your own notes. …A common symptom of MS, cognitive issues may impact many areas of one’s life, including employment, relationships, adherence to medications, and other activities of daily living. This article details current research into cognition and multiple sclerosis, while providing strategies and support for reducing the effects of this often-challenging symptom. …Following a severe relapse, Tina was left with loss of vision in one eye, dizziness, and balance problems. She had no idea that seeing-eye dogs are also trained to help mobility and balance. With her service dog by her side, Tina is ready to conquer the world! …Updates on MSAA’s programs are featured, including the MRI Access Fund, details on how to request cooling accessories to relieve heat sensitivity, and more. Read the latest issue of The Motivator – and be sure to check out the features in the NEW digital edition! How does MSAA improve lives for the multiple sclerosis community? Last week, we shared an infographic with our supporters showing just a few of the ways MSAA improves lives for the multiple sclerosis community. Today, we wanted to post that infographic again in case you missed it. There has been a lot of talk recently about good charities and bad charities. News reports have focused on charities that do little, if anything, to help alleviate social issues…and on companies who profit from the increasing need for funding to ensure missions are fulfilled. The nonprofit world is buzzing with words like “expensive ratios,” “ratings,” and “overhead.” The result: We are now taking a new look at what being a good charity really means. How can your donation improve a life today? As an organization, MSAA welcomes this conversation. We believe in using our resources efficiently to best serve the needs of the MS community. We have worked hard over the years to streamline our processes and improve our program delivery. In addition to the wealth of information and support MSAA provides, for those who would be unable to afford equipment or MRI scans on their own, MSAA’s programs make a tangible difference in day-to-day quality of life. This is attested to time and time again in the unsolicited tesmionials of our clients. Donate now and improve a life today. “Thank you so much for getting back to me so soon! After over two years of waiting and being passed off [by other organizations], my MRI is scheduled for a couple of hours from now! Thank you!” – Jordan R. from Colorado. Improve a life today for someone like Jordan. The Multiple Sclerosis Association of America is a leading resource for the entire MS community, improving lives today through vital services and support. For this month, we focused our blog around managing MS. Some helpful tips were provided and the one that sticks out to me was about “asking for help”. Understanding your limits and what you are able to accomplish in a day is a great way to conserve your energy and focus on what is important. Often times it is important to involve those around you, but navigating the “how to” is a challenge. For those who struggle with the symptoms of MS that may not be visible (i.e. fatigue, pain, and cognitive changes), the hidden symptoms of MS, asking for help from a friend or loved one can often be a daunting task. We frequently hear and read stories from individuals who feel guilty asking for help, because they don’t feel that they “look” sick. They fear they will be judged in asking for help. It may be helpful, before you tell everyone about your MS symptoms to think; does this person play a significant role in my life? And, can I rely on them in the future if I need help? If the answer to both of these questions is yes, then it is time to put on your teacher hat and educate those identified helpers about what types of symptoms you experience and what they may look, or sound like, for you. MSAA’s The Motivator Winter/Spring 2013 edition discusses may of the hidden symptoms of MS: https://www.mymsaa.org/publications/motivator/winter-spring13/. This publication can be shared with friends and loved ones to further provide education and information. Not every person with MS experiences symptoms in the same way, so providing information as to how MS looks and feels to you is very important. With more understanding and better education, we can hope to reduce the stigma around the hidden symptoms of MS and promote a more positive experience for both yourself and your loved ones. Please share your experiences, have you had to educate your friends and loved ones about the symptoms of MS? What has worked for you? 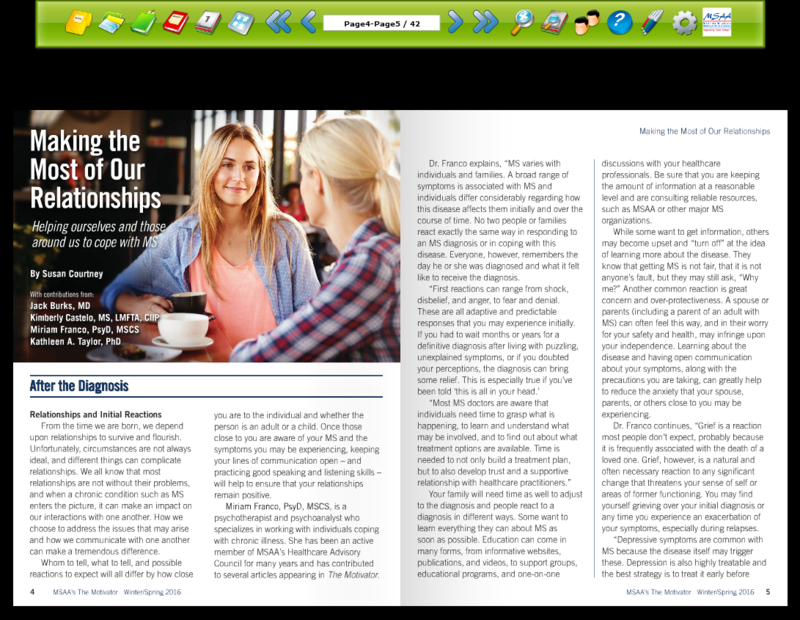 Latest Issue of The Motivator Now Available! This article describes some of the hidden symptoms of MS (including pain, fatigue, sleep, cognition, and vision), along with management strategies. The Affordable Care Act (ACA) aims to increase the availability and affordability of health insurance for millions of Americans who lack coverage. Beginning in January 2014, this historic initiative will significantly impact a substantial number of individuals with multiple sclerosis and their families. Already receive a printed copy of The Motivator magazine in the mail? Interested in receiving The Motivator electronically only? Let us know! Please visit support.mymsaa.org/motivatorupdate. MSAA’s MS Research Update is a comprehensive overview of research findings on the FDA-approved disease-modifying therapies, as well as many experimental treatments. This 2013 edition of MSAA’s MS Research Update is the first to be printed as a stand-alone issue, reflecting the diversity and scope of research progress in MS. This information is based on a wide range of sources, including the extensive journal literature on MS and its management, a review of ongoing clinical trials, and papers presented at major national and international conferences. Read MSAA’s latest MS Research Update.